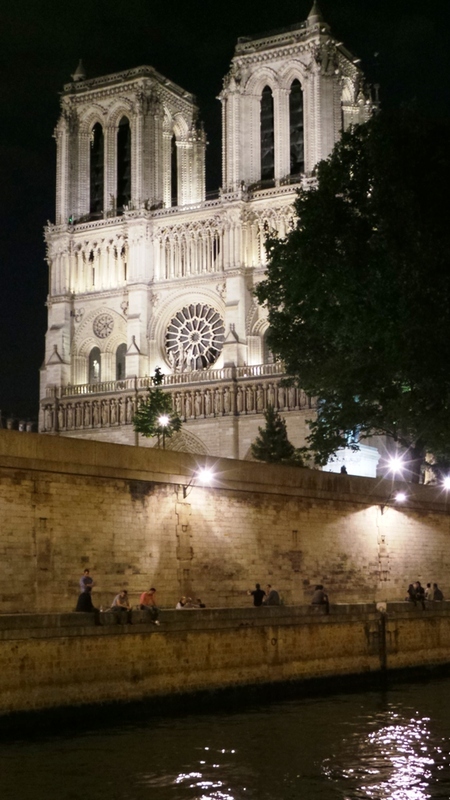 If we haven't been there…… it's on the list! 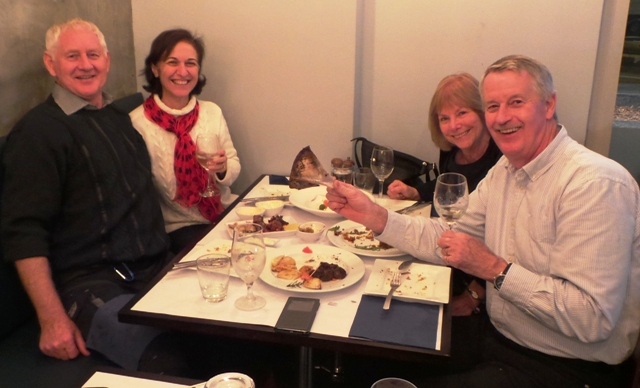 As you know we love catching up with our cruising friends and this week we tortured ourselves even more by meeting up with our friends Ray and Paula from New Zealand. Tortured you say! This week the 2015 Princess World Cruise leaves. Not only are we pained with the thought that this cruise will start without us but that is why our friends are here. 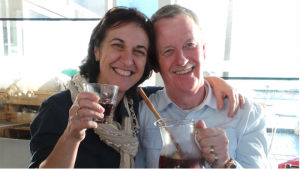 World cruises are addictive, Ray and Paula are an example of those who need their fix every year. They may not do the whole 104 days but they either start or finish it. They were staying at the Ibis Hotel at Darling Harbour which is a good position if you are sailing from White Bay. No need to negotiate inner city traffic, just straight over the Anzac bridge and within 5 minutes you are Portside. We were all ready to head down to Harbourside to find a restaurant when we passed a small Greek restaurant right there in Murray St. Now normally I am not a big fan of eating out Greek … lets face it… I grew up with it … mum was a great cook… and no one makes it the same. But I would have to say I was impressed. We chose a Greek feast for four and we ate in true Greek fashion with a fork in one hand and all the food in the centre of the table. Tzaziki, calamari, haloumi and that was just to start with. Now you know that you are in a true Greek restaurant when the taramasalata is not pink but a creamy colour… That is right, that stuff you buy in the supermarket is not what we are used to … None of my relatives made tarama with red caviar! Out came the mousaka, salad and lamb and potatoes all smelling and tasting delicious. Which of course had us comparing stories of our days in Athens and the islands. The Bar at the end of the Wharf. 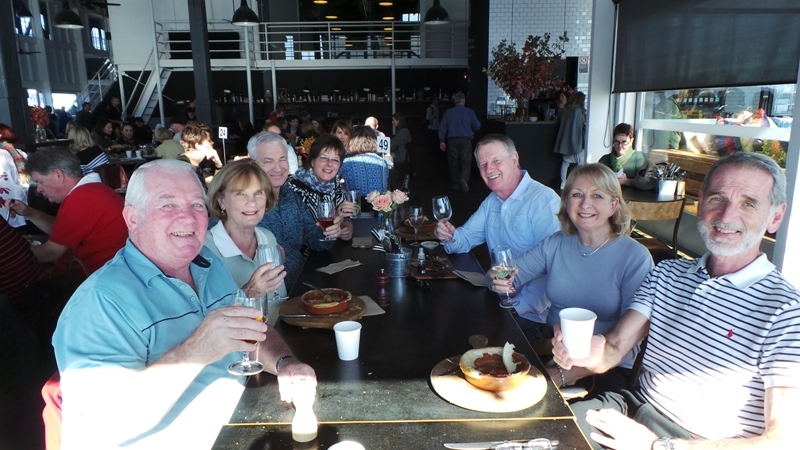 Keeping up with our cruising theme yesterday we had an informal meet and mingle with some of our fellow cruisers that will be on our Circle Pacific Cruise. It is great being able to put faces to names and it is always so much more exciting when you see these faces again on embarkation day. 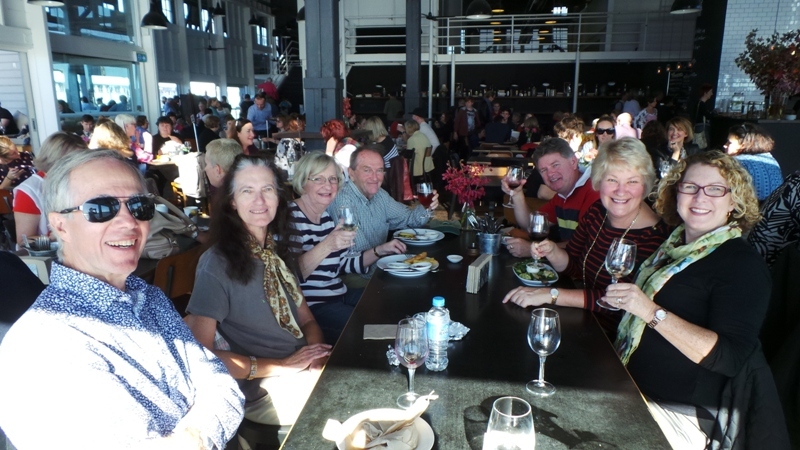 Marie chose a great venue “The Theatre Bar at the end of the Wharf “. It is located in the historic area of Walsh Bay and as the name suggests, at the end of the wharf on Pier 4. Sydney put on a glorious day. With tables by the windows, we looked straight out across the harbour to Luna Park, Blues point and the Harbour Bridge. The only thing that was missing was a cruise ship sailing past at 4pm from White Bay. Over pot pies, fish n chips and burgers, we reminisced, planned and laughed our way through the afternoon promising to do this again before the next 409 days are up. Since booking our World cruise in 2011 we have devoured any movie or TV show set in any place we have or will visit. Putting it down to all part of the research. India, either people love it or hate it. For some as soon as you mention the port of Mumbai they say, “hot, dirty, ugly … we are not getting off the ship”. The colours, the sounds, the smells, the craziness” We Love it all. So you can see why these movies are so appealing to us. 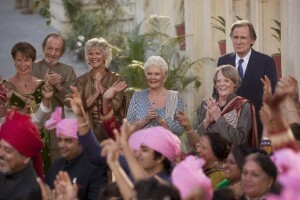 We both loved the first Exotic Marigold Hotel movie, and the second had all the makings of another great movie, the stars, the music, the laughter and Richard Gere. Watching just transports you back to those the busy streets of Mumbai. If you loved Slum dog Millionaire, the final scenes will have you crying, tapping your toes and smiling from ear to ear. Once the rain stopped we decided to pay a visit to the local supermarket to fill up our fridge. Nothing like keeping it fresh with delicious crusty bread, cheese, meat, tomatoes and wine of course. 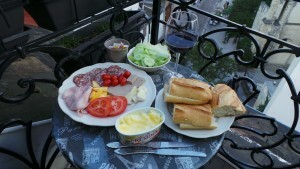 Our little balcony was the perfect spot to enjoy our dinner. 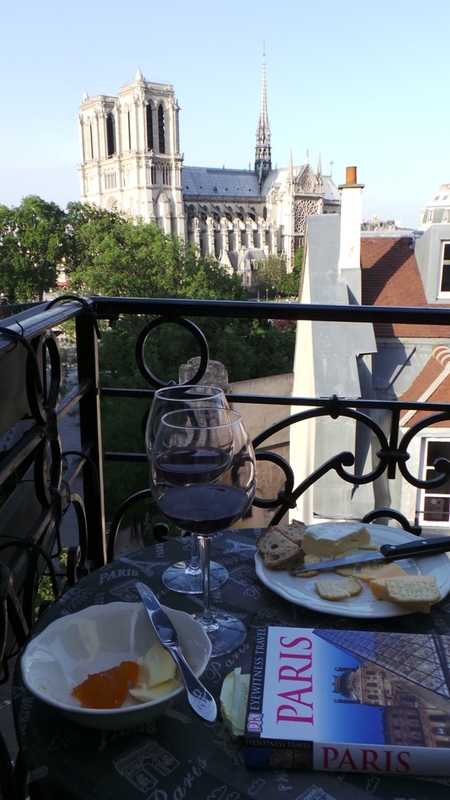 Good food, good wine, good view. With our tummies full we decided to go for a walk and soak up some of that French atmosphere. 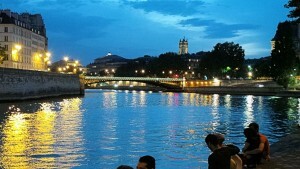 We walked down to the Seine and crossed one of the many bridges throughout Paris to the Isle of Citi. Here in it’s glory sits Notre Dame Cathedral. Day or night the square just in front is always busy with sight seers, hawkers and those just gathering for a chat. 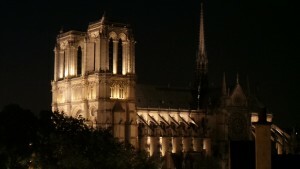 As night fell we watched as the Cathedral lit up against the black backdrop of the darkening sky. 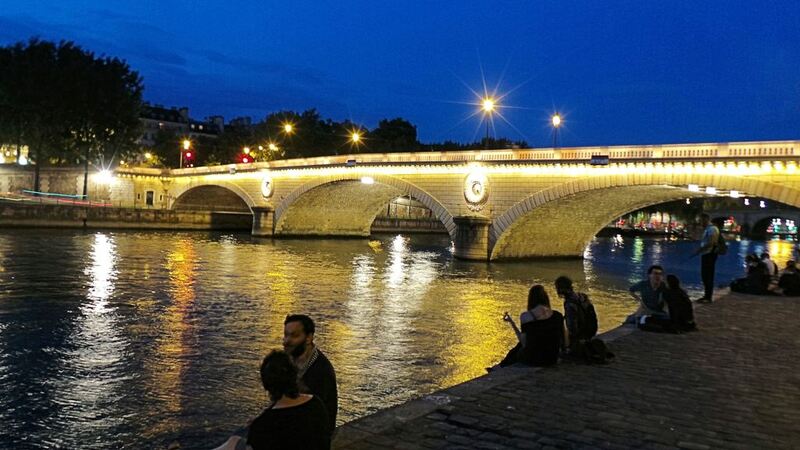 What else do you do in Paris, the city of love, but walk hand in hand along the river Seine. Not quite the ambiance that we hoped for. 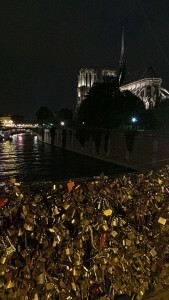 Young men and woman lined the banks swigging straight from their wine bottles. Happily chatting with their boom boxes blaring their favourite music. But far worst was every time you walked under a bridge the stench of urine was enough to make your eyes water. Obviously they didn’t want to stray too far when they wanted to relieve themselves. 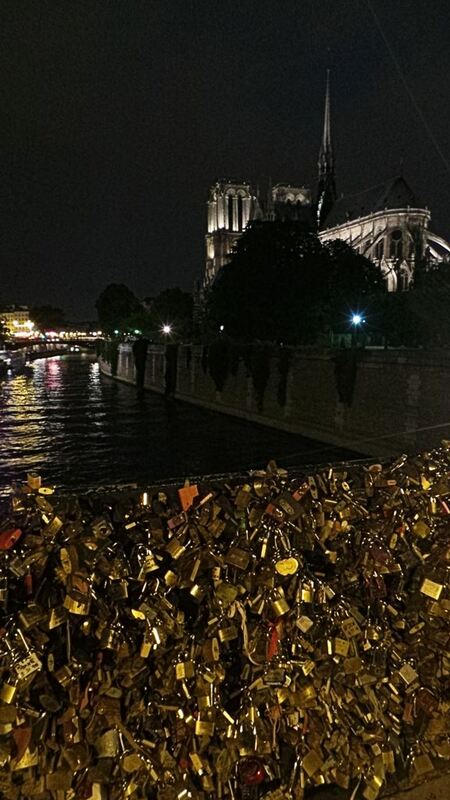 The romanticism returned once back on street level. 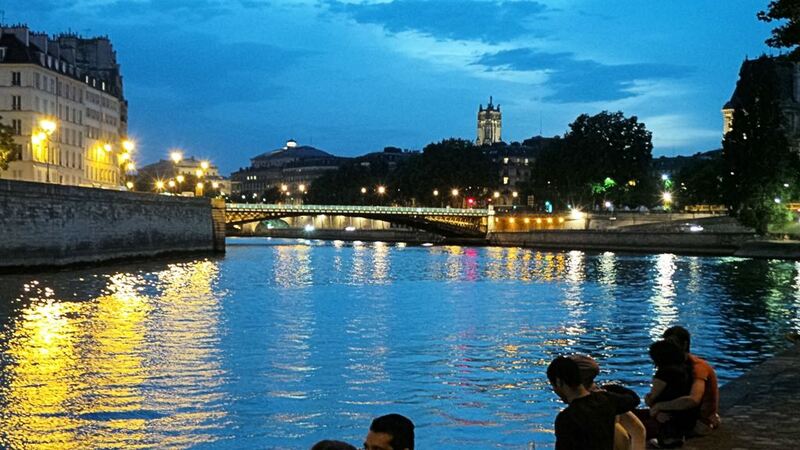 The city lights reflections shimmering in the water, beautifully lit boats gliding up and down the river. This is the time when the buskers all come out and start playing … good or bad it didn’t matter, there was always music where ever you went. Heading back over to the mainland we stolled around some of the little streets. 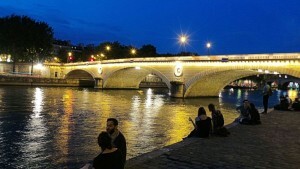 They were a buzz with many restaurants and other types of night life. All cuisines were represented, Greek, Italian, Thai, all the different aromas tempting you as you walked past each establishment. It was all good and we slept well that night. The French weather was not playing very nice today. When the Euro star arrived at Gard du Nord we were greeted by rain and a lot of it. This station is big, noisy and very busy. We could have taken the Metro to our accommodation but weather conditions and the four bags in tow did not make this an appealing option. Once in the taxi the rest was pretty painless. We arrived at our destination, the rain had eased and we found our apartment. We stayed in the Latin Quarter on Rue Galande not far from Notre Dame. Paris buildings are old and when they were built the last thing on the architects minds were long distance travellers with large suitcases. Did I mention we were on the 5th floor? The building has been renovated and a lift installed… unfortunately it started on the first floor and ended on the fourth floor. In Paris stairs are narrow in width and long in depth. This makes them pretty steep. The lifts were big enough for one person and one suitcase or two people as long as you didn’t mind being intimate. The reward for getting our bags up to the 5th floor without breaking our necks was a magnificent view of Notre Dame. 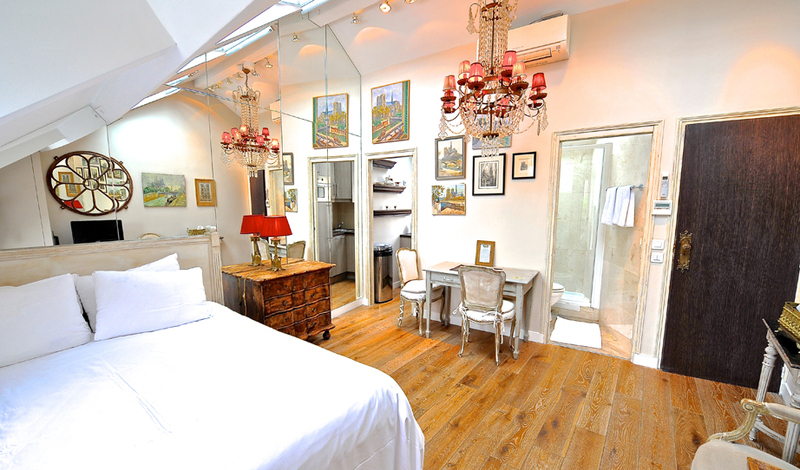 A room with a view…..
Our apartment appropriately named Esmeralda, was light, airy and decorated beautifully. It was very well equipped, although we had a Iron but no ironing board, so towels and table top it was. 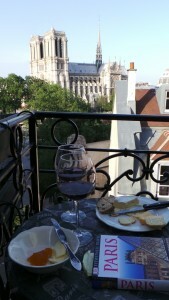 A little balcony with just enough room for a table and two chairs was the perfect setting to sit and watch Paris go by. Delicious pate’s, creamy soft cheeses and crusty baguettes became our staple, washed down with a light red wine. We shared two of our six days with Vicki and Ron, Garry’s niece from England. They flew over to spend time with us which was great and a lot of fun.